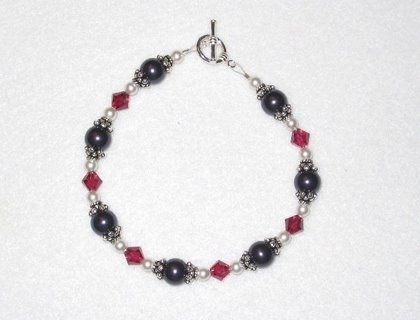 This bracelet features ruby Swarovski crystals, purple and white pearls, and is set with sterling silver findings. "Who can find a virtuous woman? For her price is far above rubies?" " . . .For all her household are clothed in scarlet . . . her clothing is silk and purple."